To farm or not to farm? Originally published in Edible Toronto Magazine. There’s a glorious blue sky outside on this sunny summer day as an enthusiastic breeze wafts in and coaxes you to come out and play in the natural world. But you are fastened to your desk at work, surrounded by four office walls instead of the four elements. Maybe the nine-to-five wheel has been making less sense lately, or you’ve become preoccupied with the science of compost. Maybe you find yourself wishing you were one of the vendors offering quaint country wares at the farmers’ market you visit each week. Perhaps you’ve always had a green thumb, a way with animals, or a love of dirt. Maybe you really just want to be a farmer? If you long for more earth, air, fire and water, it is true that the farming life will provide exposure to all—though not necessarily an easy abundance of any. It may instead give lessons on poor soil, crop-damaging winds, barn fires instead of bonfires, and what to do when the well runs dry. The romance versus the reality of farming is as stark a contrast as the black-and-white Holstein cow you may one day be milking. There is much to learn, and even more to fail at when sheer exuberance isn’t quite enough. Yet more people are opting out of their city selves in pursuit of a little place in the country, their dream farm. According to the Foundation on Future Farming, approximately 40 percent of the world’s population depend on agriculture for their livelihood. Of the 525 million farms worldwide, 85 percent are smallholders who cultivate plots of land no bigger than 2 hectares. Maybe you could, too? By Statistics Canada’s last count in 2011, the Census of Agriculture tallied 51,950 farms in Ontario, and 27,201 of those are under 53 hectares, or less than 130 acres. If you’re chomping at the bit to share that bucolic dream, first take a closer look at the stuff you’re made of. It’s a ponderous undertaking that requires a certain mindset to fill some pretty big Wellington boots. The face of farming might seem like a mostly physical endeavour, but it’s so much more than that. If you lust for land and a bit of dirt under your fingernails, you could actually be feeling the pull of a primordial truth buried deep in your ancestral cells. It may be that you just want to live, and live well. There are eight dimensions of wellness contributing to quality of life, and one job that involves all of them is sustainable farming. Farmers constantly address physical, emotional, intellectual, social, occupational, financial, environmental and spiritual wellness in a multitude of ways. Spending your days as a steward of the soil and raising animals nourishes each of these aspects. Embarking on a drastic lifestyle change is a huge challenge, though, and there’s no guarantee you’ll find instant peace or pastoral scenes. Wellness takes a lot of work. Being surrounded by the elements is certainly life-affirming, even more so during extreme challenges. Like drought: The most unbearably hot day will be the one on which you have to deal with your broken water pump and haul buckets of pond water to the garden to quench your thirsty seedlings. Or like black flies and mosquitoes: They’re not choosey—they’re happy to have you morning or evening when you’re harvesting for market or weeding to avoid the blistering noonday sun. Will you be able to handle too much rain? A week’s constant downpour will drown out your best-laid plans without any consideration for your planting or fencing schedule or your waiting CSA members. But you are free of those four walls, and each fresh day is guaranteed to be anything but dull. This might be the number one reason new farmers envision… freedom to make your own hours! Sure you can, though you will soon find that every minute belongs to the farm. From dawn to dusk, you will fall in and out of bed in a blur. But it’s your blur, not your boss’s, and hopefully you will learn to find your own moments of abandon in between. There is something about well-earned sweat… nothing like being physically tired after useful, productive and involved work. If you don’t already, learn to love labour—it stretches our bodies and our minds, and you won’t need that gym membership anymore. The upside: Look out your window and see no neighbours. The downside: Look out your window and see no neighbours. A sense of isolation is one aspect that many newbie farmers don’t count on prior to their transition to country life. Once you’ve worked through the long list of other trials, you might return to this observation and appreciate how fortunate you are to have a quiet little place on the earth. Not just to hear birds, but your own thoughts. Amidst the endless hours of nurturing other living things, make time to reflect on how your personal wellness is coming along. There will always be cities, and plenty of people out there to visit, so just be grateful. Your sanctuary really is a treasure. In a world where society seems to be heading down more questionable paths, having a sense of noble purpose is a wonderful thing. It’s an exceptional feeling to grow really good food and raise healthy animals with care, and rewarding to know you are helping to feed so many appreciative people. Your initial euphoria will have you believing you CAN do it all. But don’t try. Go slow. Pick one main thing and once you get pretty good at it you can gradually add to your ranching repertoire. Nothing spells burnout better than a first-year farmer juggling the work of ten into a 24-hour day. You need to sleep for some of that. Get help. Hire workers, interns, apprentices, family and friends, because farming rarely works well as a solo affair. Plus, you’ll have company to celebrate or commiserate with, depending on the day. Do what you love—whatever it is, so it will be mostly fun and rewarding despite the onerous learning curve. Things will go wrong. You will suffer heartaches and sometimes feel overwhelmed. Farming is no different, and if you take on too much you risk doing it poorly and ending up dissatisfied or disappointed. Research beforehand, read, apprentice with experts; many have gone before you and done it the wrong way. Learn from their experience so you don’t repeat their mistakes. Being overwhelmed isn’t fun, so try to go Zen Farmer when it gets tough, and remember those four walls. Breathe. That’s why you chose this. There is flow in a farm, I promise. It’s a sweet spot you will find more of in time, but there will be moments when it just feels like a gushing rush of chaos. A flexible demeanour helps when your chores go from what-has-to-be-done-today and what-should-be-done-this-week to make room for urgent-drop-everything-the-goats-got-into-the-garden. Accept that some days you might be swearing or in tears. You’ll lose hens to a weasel, arugula to flea beetles, zucchini to powdery mildew, and one morning might find a beautiful stillborn lamb or calf. Strong is the urge to abandon the whole notion before something else falls ill or wilts or dies. A world of guilt and blame will ride your stalwart steward shoulders as you imagine all the ways you could have prevented it. Some you could have, so get better at it. Some you simply couldn’t have. Life is cruel. In fact, it can be terribly painful. Just when you think you can’t take it anymore and want to call it quits, beauty will reappear. Because life is also beautiful. Why farm? An unfolding farm is a spectacular thing to be a part of. In the end, after all the work and wonder, effort and excitement, trials and triumphs, it’s all for the beauty… to be with the rhythms of joy, frustration, surrender and appreciation…to love. Overcoming pain is an intrinsic part of this beauty we call life, and we might never be closer to understanding the hows and whys of it than when we’re surrounded in the grow of a farm. Connecting to such elemental reality is reason enough. To farm the earth and all its living beings is to work on harvesting the best elements of your own nature. And that will only help you grow, in every sense. Story & photos by Montana Jones—originally published in Edible Toronto magazine. What could be simpler than the ubiquitous egg? Whether boiled, scrambled, poached or fried, we dearly love our delicate dozen ovals. Some will venture into duck, goose, quail, pheasant, emu, ostrich and even turkey territory, but the domestic chicken egg wins feathers down in popularity. We’ve been eating eggs since the first rooster crowed at the dawn of time. In 2009, with a worldwide laying flock of approximately 6.4 billion hens, global production was estimated at some 62 million metric tons of eggs. That’s a fair bit of cracking. But the simple facts beneath the shell aren’t all sunny-side up, let alone straight up. If you’re confused by the many different terms on egg cartons, you are not alone. The “cage-free” label helps consumers feel better, but the chicken that laid them may not be so chirpy. “Free-range” doesn’t necessarily denote hens that saw the light of day, and “organic” may not mean your breakfast was born free at all. In the quest for the best, healthiest food, consumers must do their homework. Buying food locally is not always a guarantee. Confinement agriculture and non-therapeutic use of antibiotics might still play a part in production, so it’s key to ensure the eggs you buy are indeed from farmers whose methods you support. The bottom line is, the bawk stops with you, the consumer. To find a trusted source, educate yourself on the differences, and ask lots of questions. One can’t really expect the insipid pale yellow centre and limp rubbery white of a cheerless supermarket egg to rise to any occasion in your mouth. Think where it’s been. That aftertaste is the sad resentment of a feathered prisoner. Now go and find a real egg – a good egg – laid by a real hen living the good life, which for a chicken just means scratching in a pasture, eating lots of bugs, having dust baths in the sun, and clucking about with the flock. That bird’s gift to you will taste of freedom and contentment. The egg of your dreams is gentle, easy and creamy when scrambled. It’s buttery smooth, light on your tongue, and has the surprising flavour of presence. I’m often asked why my fresh farm eggs taste of bright morning bliss while the free-range, certified-organic eggs purchased at the supermarket do not. Surely such labels mean they are prime choice? Maybe. Maybe not. This horrid practice involves pressing the chicks’ faces up to a hot blade that sears off the tip and the top half of their tender beaks. Some die after the procedure. The mutilation leaves most birds with exposed mouths and tongues, but the challenge of eating with a deformed mouth is offset by a pelleted ration that’s constantly within reach. Many egg producers claim that keeping birds confined indoors, out of daylight, never setting foot on ground or grass, and “safe” from disease, is in the chickens’ best interests. These eggs taste like the vacant regret of a poor choice. Consumers are starting to see the not-so-pretty facts behind much of our mass corporate food production, which may be why the Eggs Farmers of Ontario recently produced their warm and fuzzy “Pride in Every Egg” commercial. In it, viewers hear a happy banjo-pluckin’ ditty about hard workin’ proud farmers while the morning sun shines on a smiling family, green fields and rambling rural scenes. They don’t show the harsh reality of actual chickens in actual egg barns, and some critics feel the advertisement is deliberate, misleading greenwashing in response to the growing trend to buying locally sourced, naturally raised food directly from small farmers. Layers of these eggs are restricted to feed that is certified free of chemical fertilizers, fungicides, herbicides, pesticides, GMOs, and animal by-products. No antibiotics or synthetic chemicals are administered. Certified-organic eggs may or may not necessarily come from truly pastured chickens, but the hens will always be cage-free and free range. Organic Products Regulations (which came into effect in Canada in 2009) and Standards Council of Canada certification requirements stipulate that hens must have access to open air pens and “pasture,” however the permissible stocking density allows up to 800 hens per acre. The birds have the opportunity for exposure to a more natural environment, fresh air and exercise, but some might never step outdoors due to volume. And the exposure might not affect the flavour factor, since the sheer numbers of diners vs. bugs could prevent the hens from as varied an insect and grass diet as a pastured chickens on a small-scale organic farm might have. This label means that the hen was not given antibiotics. Newly hatched chicks are routinely given continuous antibiotics despite the absence of illness. Even small farmers intent on raising their birds “naturally” may inadvertently give their healthy chicks Amprolium-laced feed if they’re not careful to specify “non-medicated” from their feed store. So be certain your producer uses none from day one. The hormone-free label is little more than a marketing tactic, since hormone use in poultry production was banned in Canada in the 1960s. Hens that are fed a ration containing 10 to 20 percent flaxseed meal will produce eggs with higher polyunsaturated fat and Omega-3 fatty acid levels than other eggs. Some people’s palates detect a fishy aroma and flavour. At one time, “free range” described small farm flocks allowed to wander freely through meadows in search of seeds and bugs. The definition dramatically changed when the term was hijacked by the commercial egg industry. “Free-range” and “free-run” are the two most commonly misconstrued labels since they imply the hens are running about on grass, but it’s not such a picnic. Free-range birds must, by definition, have access to the outdoors, though what that means can greatly vary since there is no legal definition of the term. Canada does not regulate criteria such as environmental quality, size of the outdoor area, number of birds, or space per bird. Typically, free-range hens are still subjected to debeaking, have only 1 to 2 square feet of floor space per bird, and may or may not have access to nests or perches. Taste is the same as free-run and cage-laid eggs. “Free run” may sound like good poultry fun, but it’s still not a natural life. Birds cannot go outdoors, but are able to move around within the building, socialize, dust-bathe, and may or may not be provided with perches. They are still generally debeaked and live in crowded conditions with artificial light. Canada does not regulate this production method, either, but it is a kinder choice than caged, although no better in flavour. This good egg is the best. Whether raised for meat or eggs, pastured chickens require more time and money since birds burn calories wandering; but in that time they are growing their flavour, which is unmatched. More small-scale farmers are utilizing moveable pens (or “chicken tractors”), which means the hens enjoy a fresh patch of ground to scratch in every day. This method protects the birds from predators, and a mobile shelter makes it easy to collect their daily oval offerings. Pastured hens should not be debeaked. If you’ve always eaten factory-farmed eggs from grain-fed hens, you might not realize that a real egg is not supposed to sport a pale yellow yolk. The grass eaten by pastured poultry contains chlorophyll which, along with the hens’ heavy ingestion of insects and grubs, produces orange egg yolks and incredible flavour. Be sure the pastured eggs you buy are not from hens raised on bare ground that has long since been scratched away to dirt, because the desired flavour and colour will be missing. In winter I offer my girls second-cut alfalfa hay and wheat or other sprouted grass so they keep laying those golden eggs. According to a study published in 2010 in The Cambridge Journals, the eggs from pastured hens contain about two-and-a-half times more total omega-3 fatty acids and vitamin E than those of their less fortunate factory cousins. They also have 38 percent higher concentrations of vitamin A. A 2007 Mother Earth News study reports that pastured hens contain 25 percent less saturated fat, 34 percent less cholesterol, 65 percent more vitamin A, up to three times the amount of vitamin E, and seven times more beta carotene than non-pastured eggs. Need I say more? To find a good egg requires dedication and research. Your best bet for sourcing pastured organic eggs is to buy them directly from a farm where you can see how the flock is raised. The next option might be a farmers’ market, but most of the eggs sold there are not the elusive treasures you seek. Farmers are not legally allowed to sell their eggs from anywhere but the farm gate unless the eggs have been graded for quality; an unrealistic situation for most small-scale farmers given that grading stations are few and far between. Theoretically, if eggs are labelled “Not for human consumption,” one could score some at a farmers’ market with a secret password whispered to a furtive farmer in a trench coat. Until regulations are changed, however, if that farmer who works so hard to raise the best possible food for you dares to offer ungraded fresh eggs for sale in a public place, he or she can be arrested and charged. This being said, there are a few small producers of local, organically grown pastured eggs who do have on-farm grading facilities Their “small flock” eggs are available at select farmers’ markets and from independent grocery stores. Just remember to do your research and ask lots of questions about the hens’ feed and whether they have total access to fresh pasture. As more consumers demand a better standard for their food choices, more retail stores and restaurants will refuse to carry products from animals raised in confinement with unnecessary medication. Producers will be required to evolve, and will adopt more natural livestock management systems in healthier environments, which also produces tastier food. Deciphering cartons in the egg aisle wouldn’t be an issue at all if country and urban dwellers alike could all raise a few backyard chickens for their own eggs. Until this becomes legal, your best eggs will be from hens naturally pastured outdoors under blue skies, on grass and bugs, and supplemented with organic or unsprayed grains. Commercial eggs may have been stored for weeks before they reach your plate. To test for freshness, immerse an uncooked egg in water in a glass bowl. A fresh egg will lie flat on its side because the air sac inside is still so small. The older the egg, the more air enters the porous shell and the air sac expands, which makes the egg tilt upwards, or stand up, if it’s quite old. And if it floats? Run, don’t walk. It’s rotten. When you break it open, an older egg will spread its runny, raw clear albumen (egg white) flat over a plate. With a good egg, both the yolk and the white sit up high and firm. The long light of Thanksgiving spills fresh orange across the day under autumn’s lustrous sky. The garden is spent, the larder is full, and focus shifts to savouring the farm’s fall bounty. A chorus of applauding leaves rustle their appreciation as award-winning Chef Jamie Kennedy strolls up the lane of Wholearth Farmstudio. It’s a long way from the city’s top restaurants, but in crisp whites and apron, he looks as comfortable sauntering here as his Gilead Café in Toronto. On one side, dark-faced heritage Shropshire sheep peer back at him through cedar rail fences; on the other, a group of chortling amber pigs busy themselves rooting up a particularly interesting clod in their pasture. Preparing good, real food with veneration, and sharing it with friends and family is a deep sweet satisfaction on this Hastings farm. That simple inclination grew into the Wholearth Heritage Harvest Feast, a field-to-table gathering uniting chefs, guests and farmers. Visitors walk with heritage sheep and poultry in the field, see vegetables in the garden, then taste the exquisite flavours outdoors on a plate. They are here to celebrate cuisine where it begins; to appreciate dinner on the same soil where the menu was grown, prepared by chefs who care as passionately about food as the farmers who raised it. Jamie heads to a grassy rise beside the farmhouse, where he’s been lovingly roasting a heritage Tamworth pig since the wee hours. He joins local chefs Brad Watt (Rare Grill), Lisa Dixon (Black Honey) and Evan Podd (38 Degrees and Old Bridge Inn), who also believe that familiarity with the farm is a perfect way to understand the notion of local, seasonal food. Brad is bent over his pork belly, adjusting the grill in anticipation of painting on a glaze of wild elderberry, while Evan caramelizes onions for his apple cider-braised Jersey Giant chicken. It’s a rare chicken, one of several heritage breeds at Wholearth, that have the delicious distinction of being on the Slow Food Ark of Taste, as do the Tamworth pigs and Bourbon Red turkeys raised here. 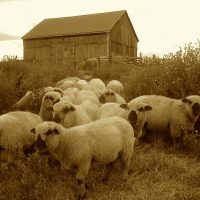 Heritage breeds have a unique depth of flavour and succulence that can’t be found in supermarket meats. Likewise, heirloom vegetables are exceptional in appearance and taste. It’s a fine fall day on the land, among animals and good people appreciating the rhythm and reward of growing earth’s gifts…the kind of day your heart feels like the sun in your chest. *To reserve your place at the farm field table visit the Wholearth Heritage Harvest Feast website. Shall I keep you posted? Enter your email address and I'll let you know about any new stories, articles and posts. Your email will never be shared, sold or published.